The systemic approach - Website of pspada! 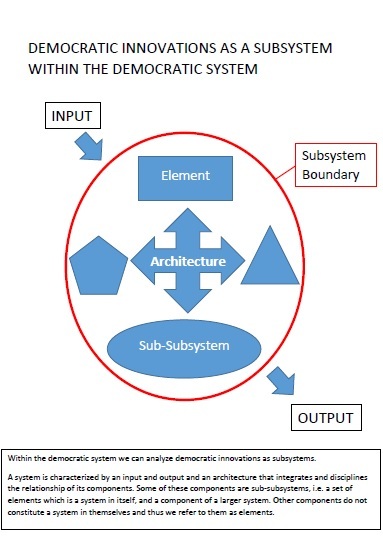 My most recent research, in collaboration with too many friends to cite, is integrating the knowledge developed to build the data structure of Participedia and the research conducted on multichannel democratic innovations in the Empatia project to create a unified framework to support empirical research on participatory and deliberative processes. This is an empirical counterpart to the normative deliberative system theory. The first paper I am completing leverages the systemic approach to systematize the knowledge we have on the impact of minipublics on efficacy.